Bristol is a historic town located in Bristol county Rhode Island. 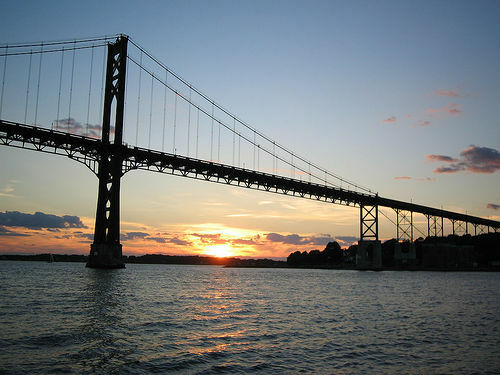 It is located midway between Newport and Providence, RI. Bristol has the oldest continuously celebrated Independence Day festivities in the United States with its famous 4th of July parade, carnival, and concerts. There are also excellent places to eat and shop along the Waterfront and on Hope Street. Bristol has a population of 23,000 and the median home value is $300,400. Check out our smart home price tool for a free instant property evaluation for your Bristol home. Bristol is a quintessential New England waterfront town that seamlessly blends outdoor beauty with cultural pleasures. It is a nice place to raise a family because of its excellent school system and recreational areas, such as beautiful Colt State Park, Independence Park, or Coelho Park. Colt State Park is a large historic park where you can bicycle, walk, jog, boat, fish, or picnic with family. In the summertime, you could also spend a day at the Bristol Town Beach or bike along the East Bay Bike Path. Bristol is also home to Roger Williams University. Linden Place is a historic house museum in Bristol that was home to the DeWolfs and the Colts, two of the wealthiest slave-trading families in the United States. Tour are available to the museum and visitors are welcome to view the gardens, 18th century gazebo, and the Bristol Art Museum in Linden Place’s 19th Century Barn. Blithewold Mansion, Gardens and Arboretum, located in Bristol, is an “English Country Manor” with an arboretum on 32 acres with over 300 species of woody plants in its arboretum and gardens, including both native and exotic species. The mansion and its grounds were established in the 1890s by Augustus Van Winkle and his wife, Bessie. The property was listed on the National Register of Historic Places in 1980. It is open for tours year-round. Blithewold was named in Yankee Magazine’s 2010 Best 5 Public Gardens.